Got a wonderful early Christmas present in my email a few days back. My store was given the rights to sell the official Good Smile Company/Max Factory Toho (Touhou) Project figures! 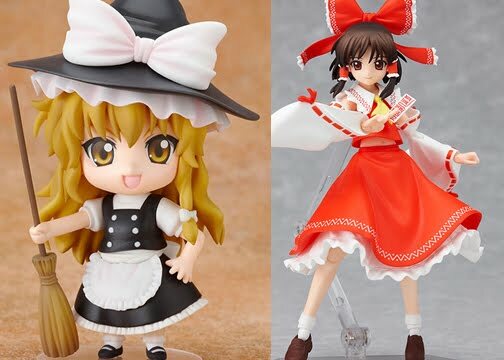 That's correct, I'll be stocking the very rare Figma Reimu Hakurei and Nendoroid Marisa Kirisame figures! Much like the recent Saber Lily Good Smile Company figure, these figures will be so hard to get that even in Japan there will be slim pickings. Just one glance over at eBay and you'll notice that their pre-orders are going for $80 and over. I'm not a thief like them so I'm keeping the price based on my costs ^^. As a side note, those pre-sales and practically all anime figure pre-orders on eBay are actually against eBay rules since the figures must be able to be shipped out 30 days after purchase...so go ahead and report those guys if you want. Many of the pre-order figures on there are either fakes and/or won't come out for another 3-4 months -_- In other words, expect these to be highly bootlegged so choose your seller wisely. My wholesaler directly in Japan, mile-stone.jp were the ones who helped me out with this and of course once they come in (which should be either January or ~February of 2010) I will gladly show images of the boxes with the appropriate stickers that show their authenticity.